Quality German Shepherds - THE ULTIMATE CANINE COMPANION – with beauty and brains, what Shepherds used to be! We are a small breeding facility, located on a five acre ranch in the Majestic High Desert of southern California. Our goal is to produce healthy, sound, excellent quality puppies for loving family companions. Temperament is of primary importance in our breeding program. We specialize in a loving, caring and willing temperament for a best friend or companion. A German Shepherd should be sound in mind and body, a working dog with great stamina. With a lively, high spirited temperament, the dog must be cooperative, adapting to every situation and take to work willingly and joyfully. The German Shepherd must show courage, defending his owner and his property but otherwise being fully attentive, obedient and a pleasant household companion. In general he makes a superior working dog for herding, search and rescue, protection and above all a family companion. The German Shepherd Dog is a far reaching long striding animal with a flying trot, covering the maximum amount of ground with the minimum number of steps. He has an all weatherproof coat (a double coat of medium length). The outer coat should be as dense as possible, hair straight, harsh and lying close to the body. His eyes should be almond shaped and brown in color and have a lively, intelligent, self-confident noble expression. The German Shepherd Dog is longer than tall. The desirable long proportion is not derived from a long back, but from overall length with relation to height, which is achieved by length of forequarter and length of withers and hindquarter, viewed from the side. Ears should be held erect, moderately pointed and open toward the front and carried erect when at attention. We strive to produce sound and intelligent German Shepherds, free from hereditary diseases. All of our breeding stock have OFA certificates rating good and clear. We breed only the very best of bloodlines to create the ultimate working and loyal companion. 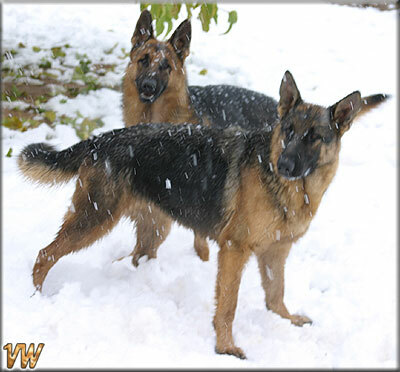 Our adult German Shepherds are from Import and Domestic champion bloodlines. Our puppies have solid nerves, stable temperaments, high intelligence for trainability, loving dispositions, great play and working drives, sound minds and bodies with combined physical beauty. Our puppies are well bred, a sight to behold, healthy, alert and grow up into beautiful faithful guardians and companions. All our puppies are whelped and raised indoors to insure their good health and even temperament. Curiosity is a way of life for all puppies. A new puppy is ready to meet new friends and the see the world. Socialization includes not only meeting new people but also being introduced to new experiences such as riding in the car, having his coat brushed, hearing the television, walking in a crowd, the list is endless. The more your pup experiences it will be a happier and better companion. When you get a puppy from Silverstar / Von Wenger you are getting a puppy that has been well socialized with children, adults and a variety of other animals. When you purchase your German Shepherd puppy from us, we want you to know that we are here for the lifetime of your puppy. If you are planning a trip or vacation and are unable to take your pet with you we offer boarding. We feel it is better for the puppy to come back to a familiar place than unfamiliar surroundings. We truly enjoy visiting with our past puppies and their families, seeing how they have grown and developed into wonderful adult German Shepherds. On occasion we have young adults for sale or placement and mature retired German Shepherds looking for a great home, E-MAIL US FOR A LIST.